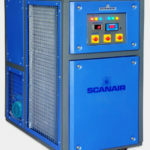 Scanair oil chillers used for applications such as hydraulics, cutting, lubrication, broaching, honing, quenching, etc., also helps as a cooling media in other words, the heat dissipated during the process is carried away by the circulating oil, now this oil needs to be maintained at a certain temperature range to retain its physical and chemical properties. Our oil chillers adapt the most proven design to suit specific application. Where the direct oil cooling is not advised we applied secondary system in water acts as the secondary refrigerant. Oil chillers are available in configuration like stand alone in which the oil recirculating pump in built and immersion type in which the evaporator coil is dipped directly in the oil sump. Oil chillers will maintain the temperature range from 10˚ C To 30˚ C ± 1˚ C. capacity from 450 Kcal/Hr to 150000 Kcal/Hr from 5 LPM To 200 LPM with different flow capacity. Hydraulic power pack, fluid cooling for machine tools like Milling Machines, when the metals are cut the friction causes heat to build up in the recirculated cutting oil, by controlling the cutting fluid temperature, greater accuracy can be achieved because thermal expansion and contraction of the material is eliminated. Always use a liquid heat ex-changer with one path for the cutting oil and the other path for the chiller. Those applications need to be cooled to a precise temperature to reduce life of oil, properties, product quality and productivity. Scanair Oil chillers, new generation in design and style, built aesthetically to match the modern trend in equipment manufacturing. Die Casting Chillers is a must as most of the die casting process are made from non-ferrous metals, specifically zinc, copper, aluminum, magnesium, lead, and tin based alloys, although ferrous metal die castings are possible. The die casting method is especially suited for applications. Where a large quantity of small to medium sized parts are needed with good detail, a fine surface quality and dimensional consistency.In the process the heat dissipated during is carried out by the way off circulating chilled oil, now this oil needs to be maintained at a certain temperature range to retain its physical and chemical properties. Our oil chillers adapt the most proven design to suit specific application.